The Harwood Institute’s highly-acclaimed Public Innovators Lab is coming to Canada with Canadian trainers and Canadian content. The Lab will immerse you in applied learning, real-life scenarios of how this work has been used and how to take action using a rigorous framework rooted in 30 years of community change work. WHAT IS THE PUBLIC INNOVATORS LAB? Understand the underlying conditions of change and build the Public Capital that creates and sustains change in communities. Engage community members and grass roots organizations – differently from the very beginning. Assess the stages of community life and match strategies to the community’s stage. Ask the right questions and listen to the community in a deeper way. Identify and match your sphere of influence to what matters to the community – i.e. action that creates impact and momentum. WHAT DO YOU GO HOME WITH? A Community Conversation Guide to help you lead Community Conversations in your community. A Public Innovator Toolkit ready for you to use with your staff and partners. A library of videos that you can use to spread what it means to Turn Outward with staff and partners. Access to more than 2,000 public innovators worldwide through Harwood’s Public Innovators Listserv. Three months of weekly tools, real world case studies, and tips on using what you’ve learned plus a monthly newsletter and Rich Harwood’s blog. People who play a key role in driving the execution of programs or initiatives that address community challenges. Senior staff that lead programmatic areas or are responsible for coordinating community initiatives. CEOs of organizations that are directly engaged in ensuring that community work gets done. People responsible for community impact, outreach, volunteer engagement, donor engagement or other areas around strengthening support of the community. Registration includes training, all learning resources and material plus 3 continental breakfasts, 2 lunches and nutrition breaks. In 2013 my library made a commitment to connecting more deeply with our community. We wanted to know that we were doing work that really mattered, but we didn’t know how to move beyond our usual strategies for engagement. We needed help and guidance. When we encountered the work of the Harwood Institute, we immediately recognized its authenticity, its groundedness, and its human-centred approach. The Harwood method offers both a guiding philosophy, and a very concrete set of tools. It emphasizes the development of deep community knowledge, consistent scrutiny of organizational motivations and practices, and realistic, incremental change. I was lucky enough to be sent to the first Harwood Innovator Lab for librarians, and what I learned there launched the most challenging and satisfying work of my career. The work that began here at North Vancouver City Library has evolved into a multi-city, multi-year project, involving numerous community-serving organizations. This process has pushed us to think beyond programs and services, to what connects us as humans - and what we as individuals and organizations need to do to honour and nourish those connections. It has created profound changes in the way we approach our work in community – and we KNOW that it matters. In 2012 the United Ways of Leeds and Grenville, Northumberland, Oxford and Sault Ste Marie received an Ontario Trillium Foundation grant to aid each of us on our journey to community impact. We had all had the opportunity to hear Rich Harwood of the Harwood Institute for Public Innovation at a recent United Ways of Ontario meeting and were interested in using his approach in our joint project that we named “Action for Community Change”. We were fortunate to get 2 of the 4 trained Harwood Coaches in Canada, Joanne Linzey and Susan Taylor Simpson and we were thrilled when they came on board as our Project Facilitators. 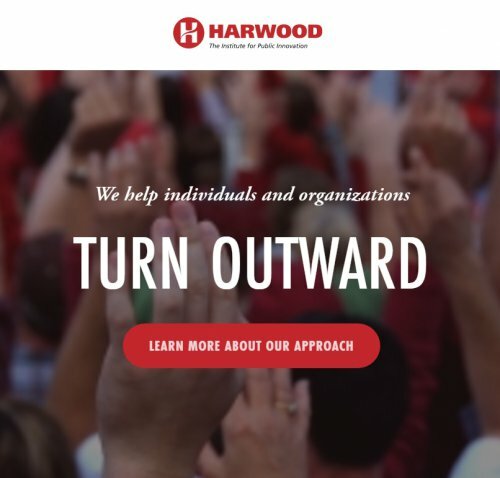 The Harwood approach is so different than any other we had utilized for gaining insight into our communities. It taught us the importance of “turning outward” and really listening to the community through grassroots conversations. As we listened we learned about the communities “aspirations, their challenges and what needed to change in the community to reach those aspirations” It was a whole new way of connecting with our communities and it totally has changed our way of thinking and doing business at our United Way. We have received high praise from the media, and our local community stakeholders for utilizing the Harwood approach. It provided the tools we required to aid us on our journey to community impact and to gain deep insight into our communities.